We introduce this LED Waterproof Dual Color Strip Camping Light for a wide range of applications, including camper trailer, tents, caravan and RV Applications, but it is mostly used as a camping light. With a programmed dimmer Switch, you can adjust the light between amber and the white color, cool White light and ON/Off. The special amber light can keep bugs and mosquitoes away from your light and camping area. By rotating the dimmer switch, the brightness level of the cool White light is adjustable to suit your different requirements. The cigarette connector makes it easy to charge to power your lights. LED technology allows for longer periods of continuous illumination for the vehicle battery power and saves energy as well. It is highly recommended for your camping uses due to its considerable design, technology and versatility. • Programmed dimmer switch to adjust the light between amber and white color, cool White light ON/Off. • Rotate the dimmer switch to adjust the brightness levels from 33 to 1000 Lumens. • A Top quality, superior product on the market for lights of a similar nature there is no comparison in quality. 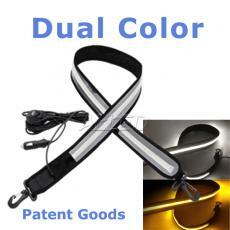 How to collect the dual color flexible LED camping light? How to use the Velcro warp of led camping light? Placed our order Sunday and received our order Wednesday. Great service great price and even better product!!! Highly recommended and will be back to purchase more. Told our family and friends how fantastic product and service is. Almost the earliest launch of product on the market and the price is reasonable. Its the smartest product I ever come across. Excllent light - great in the caravan annex - keeps the bugs away on amber. Great service too - thanks for getting it to me before our trip! thanks, you can write someting in comment.